On Saturday, December 1, the Greenwood High School Science Olympiad attended the state invitationals in Louisville. The team of 15 competed in 20 events, all of which were math and science related. Saturday morning students were told to arrive at Greenwood at 4:20 in the morning. Everyone was drowsy as the teams loaded all of the equipment needed onto the underside of the bus. The drive was quiet, as most everyone was asleep, but some were dedicated enough to study for their event. Upon arrival to J. Graham Brown School, teams unloaded in the rain and checked in. Round one began shortly after arrival, followed by five other rounds and an awards ceremony. Ms. Leeper and Ms. Asberry went to help out with Experimental Design and Mrs. Murphy attended a coaches meeting, so students were primarily responsible for getting to their events on time. Rounds were about an hour long, but students were allowed to leave the testing room after they finished their test. They were required to stay in the cafeteria, which is where all of the teams were being housed. Lunch was not built into to schedule so students had to fend for themselves in between rounds. Most students competed in at least three events. There was an hour of free period where test grading was completed and students cleaned up their areas. Awards commenced shortly afterwards. Greenwood placed sixth overall against five magnet schools, which are known for being competitive. duPont Manual took the top three spots with three of their five teams. Students were brought home late Saturday. Region tournament will be held March 23, so students will spend the next few months preparing. 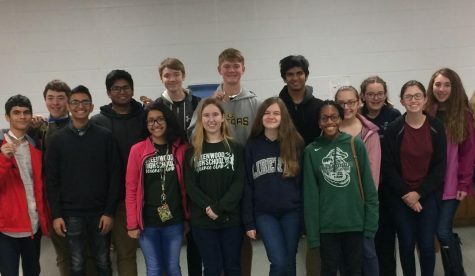 Science Olympiad team after competition on December 1, 2018.